Here’s a free hand embroidery pattern for you, just in case you’re looking for something fun to work on over the weekend. This is a little doodle I doodled up, using a Jacobean design from an old book as the basis of it, and then altering it as I doodled along. The original design can be found in Jacobean Embroidery: Its Forms and Fillings by Ada Wentworth Fitzwilliam & A. F. Morris Hands, which is available free in many formats on Project Gutenberg. 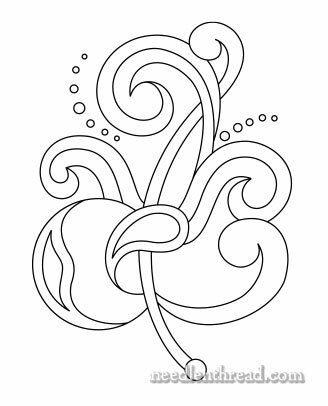 You’ll find the original Jacobean leaf design here, plate 16 in the book. You might also recognize hints of the design in my Jumble Lattice Sampler, which was originally called a Jacobean Jumble. Believe it or not, this design played a part in the original doodle for that. I’m using this design as a little practice project right now, and I’ll show you the results down the road! In the meantime, though, you can attack the design with any kind of embroidery thread – from regular stranded cotton to goldwork threads, and everything in between – and with practically any stitches. The open areas beckon for filling. The swirled areas beckon for textured stitches and line stitches. Really, anything goes with this type of design! You can certainly also opt for traditional crewel stitches, like stem stitch, long & short stitch filling, various isolated fillings, lattice stitches, and so forth. You can adapt the design for different techniques. Whitework and pulled thread fillings? Goldwork? Blackwork? All kinds of possibilities! If you have a hard time tackling dots, you might take a look at this tutorial for perfect satin stitch dots, and at this tutorial for Rhodes stitch in the round. Here’s the link for the printable pattern. It’s a PDF, and if you choose “no scaling” on your printer (or whatever setting your printer has, to keep it from changing the size of the printed page), the design will print at 5″ tall and a little over 4″ wide. I’ll show you what I’m up to with it soon! You can find heaps more hand embroidery patterns available here on Needle ‘n Thread for your personal use. If you’re itching to stitch something, but you don’t know what, have a browse through my list of hand embroidery patterns to see if something strikes your fancy! Ah, same here, Rita – though it’s cleared up here in Kansas, it’s cold, cold, cold out! So a perfect weekend for getting indoor stuff done. I’ll be stitching on three different projects this weekend, including this pattern. I have to go into the city today – it’s a two hour drive each way – so I might even take some stitching along with me. I hope you have a wonderful weekend, too! Thanks so much for this pretty pattern, it certainly looks a flexible design and maybe a great design for Tambour work, anyway a great piece of embroidery for those cold dark evenings that are upon us now, I hope you have a great weekend and enjoyed your journey to the City. A right snazzy little design. You know how to pick em’ and doodle ’em over. I like it’s inside outside illusion possibilities. Thank you. Hi!! Thanks so much for the tip. I’m going to enjoy this design very much XD. Greetings from México. Thank you Mary, for another gorgeous design. I’m enjoying doing the Jumbler so much!